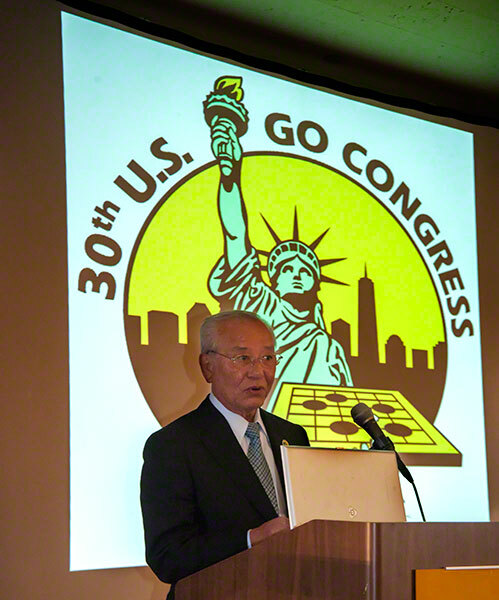 Further details of the Iwamoto North America Foundation for Go (INAF) were announced Saturday during the opening ceremonies of the 2014 US Go Congress. “Go builds strong ties between people and countries,” said Nihon Kiin Chairman Norio Wada (left). “This is an exciting and encouraging next step,” said AGA President Andy Okun. INAF is a nonprofit corporation formed by Nihon Kiin in collaboration with the American Go Association (Nihon Kiin & AGA Ink Deal for Iwamoto North America Foundation 11/25/2013 EJ). The official start date will be October 24, when the Foundation’s first Board Meeting is held in Tokyo. 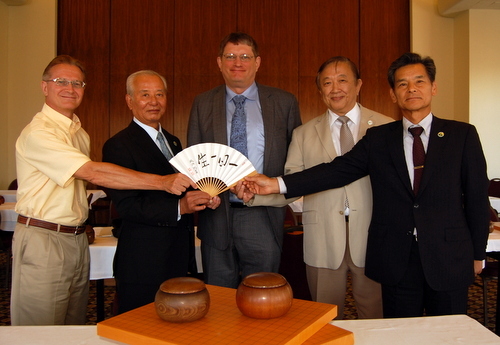 The missions of INAF are to foster, promulgate, and develop the game and culture of go in North America, according to the vision and wishes of the late Japanese go master, Iwamoto Kaoru. It will provide grants to support such promotional activities for go as teaching events, cultural exchanges, educational activities in schools, and public awareness programs in North America, including the establishment of a new East Coast Go Center.